The average price for this game in the past 6 months is $11.60. The game first became 50% off on Sep 20, 2016 at Microsoft. Lowest historic price was $10 on Dec 27, 2018 at Microsoft. The average price for this game in the past 6 months is $10.99. The game first became 50% off on Jun 13, 2017 at . Lowest historic price was $7.99 on Dec 22, 2017 at PlayStation Store. If you don't care for the complete/GOTY edition - Dragon Age: Inquisition is a decent enough BioWare RPG at $5. The game gets a bit slow in the middle but honestly if you enjoy open-world, fantasy setting and a decent enough story - Inquisition delivers. Just make sure you get out of the Hinterlands ASAP to progress through the actual plot line. The average price for this game since released is $35.61. The game first became 50% off on Apr 2, 2015 at Origin. Lowest historic price was $4.99 on Aug 15, 2017 at Origin. Dragon Age: Inquisition down to a mere $8 today at Uplay? Wait... Uplay sells Origin games? I guess, and a new low by $2. Dragon Age: Inquisition ties its all time low at DLGamer. Authorized EA Origin retailer. Inquisition just gets cheaper and cheaper as Origin's Winter Sale chums along. At $16, we highly recommend this excellent BioWare RPG, particularly for Dragon Age fans waiting for a cheaper entry point. Dragon Age Inquisition hits historic low price of $15 in Origin's Black Friday sale. Deal ends later this weekend. If you're a BioWare RPG fan, this is an excellent title to pick up with plenty of decent gaming hours. The average price for this game since released is $26.85. The game first became 50% off on Dec 19, 2015 at Origin. Lowest historic price was $14.99 on Nov 22, 2016 at Origin. Dragon Age: Inquisition - Game of the Year Edition at its historic low price of $20. If you haven't tried Inquisition out yet might be worth picking up the GOTY this weekend with all the DLCs release. Half the usual $40. Dragon Age Inquisition GOTY hits an all new low at $20 for PC today at Amazon. Lowest price yet by $8. Limited time offer. Dragon Age: Inquisition GOTY hits historic low. Probably one of the better Dragon Age title yet and worth a pick up if you enjoy a good BioWare RPG. Comes with all available content. If you don't care for the fluff, base game is $14 which is also historic low price. Another interesting EA game on sale at GameStop is the Dragon Age: Inquisition - Game of the Year Edition slashed to $30. Ties its all time low of $30. A price not seen since November. Most of the good deals in the Origin Holiday sale are over, but one that still lingers is this discount to $30 on Dragon Age Inquisition GOTY. Includes of course the base game + all DLC. The average price for this game since released is $18.73. The game first became 50% off on Dec 16, 2016 at GameStop. Lowest historic price was $0.97 on Sep 1, 2017 at GameStop. If you still don't have Dragon Age: Inquisition in your gaming library - we think $6 is a great price to add to collection. (However if you just want to try the game out, you might as well get EA Access in March to double dip on the game and 10 hour access to Mass Effect Andromeda). The average price for this game since released is $38.77. The game first became 50% off on Jun 16, 2015 at Amazon. Lowest historic price was $11.99 on Jun 13, 2017 at . New low on used copies of Dragon Age Inquisition for the PS4 at Gamefly. Xbox One copy also on sale for same price (though its been lower at $12.99 before). Free ship, continental US only. Last month $30 Dragon Age Inquisition was a big deal, but now it's only $20 in a Best Buy Daily Deal. Today only the PS4, PS3, Xbox 360, Xbox One, and PC platforms dropped to $19.99. Free store pickup available or free shipping if your total order is $35+. Amazon puts a big discount on Dragon Age: Inquisition, today only. All platforms (PS4, PS3, Xbox One, Xbox 360, PC) have dropped to $30. Dragon Age: Inquisition for the PS4, Xbox One, X360, and PS3 is down to $40 with free store pickup or free shipping on orders $50 and above. Very decent $20 off one of the top games of 2014 - if not the top game of 2014. Walmart is running a random but very decent sale on PS4 copies of Dragon Age: Inquisition. Can order online and pick up at your local Walmart. Shipping is free if order is over $50. Xbox Live Gold Members get Dragon Age: Inquisition for only five bucks this week. Historic low price point for one of the best RPGs of 2014. The best Dragon Age game? I would argue not, but for five bucks ignore at your own peril. The average price for this game since released is $33.31. The game first became 50% off on Jun 16, 2015 at Amazon. Lowest historic price was $4.99 on Jun 6, 2017 at Microsoft. Gamefly has used Xbox One copies of Dragon Age Inquisition on sale for only $13. 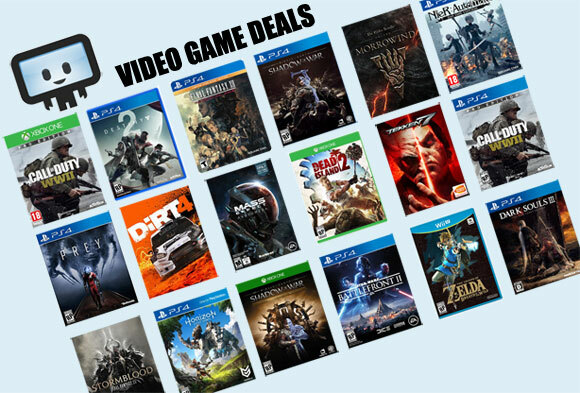 PS3 and Xbox 360 versions are $10. All lowest price. Excellent game to pick up for RPG and BioWare fans. Pre-owned copies of Dragon Age Inquisition is only $18 at Gamefly. PS4 copies available too. Free shipping. While the game has some flaw (overcompensating open world and initial slow plot) - it's still an excellent title to pick up at this price point. At $40, Dragon Age: Inquisition is a strong buy. If you're eager for a little bit of the BioWare of the old and some solid RPG gaming, you really can't go wrong. I'm only 20% through the game but thus far I enjoy it 90% of the time. Good stuff. If you're excited about next week's Dragon Age: Inquisition - you're not alone. Pre-order from MSFT store to receive $15 Xbox points bonus plus release day delivery (must order by 2 PM Pacific time today). Microsoft Store finally has the gift card + free release day delivery combo available for Dragon Age: Inquisition on the Xbox One. Strangely the offer is not available for 360 owners. Bummer? Always a solid deal as you're essentially getting the game for $10 off plus you don't even have to leave the house. Nice. Looking to get Dragon Age: Inquisition one the Xbox One. There's an impressive discount on the Deluxe Edition on Xbox Live/the Xbox Store. Only $35, which is $35 off the original $70. Right now the standard edition is selling for $60 on Xbox Live.